Here you can find a strain description about G13 SSH and also some user-based reviews and infos directly from the SeedFinder (if available). You can also find the offers and auctions here if G13 SSH cannabis seeds are on stock at MyCannapot right now. This is a mostly sativa strain. Airy big haze buds, wrapped in small resin bubbles. The high is not what everybody likes and we would recommend this just to sativa lovers. Its all in the head with a minimum of body high. A "you need to do something" type of high. 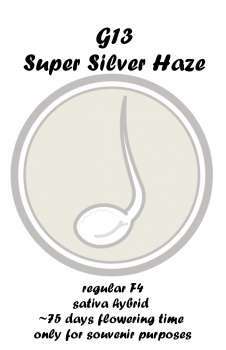 A practical to grow oldschool haze with a good yield. Great strain for outdoor activitys like surfing, biking or fishing. This is our version of Lady Cane, the orginal crossbreed was created by Eskobar. Buy G13 SSH now at MyCannapot!